The UB-B series is a Bluetooth® interface board. 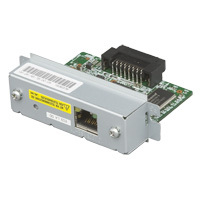 The UB-E series is a 10BASE-T and 100BASE-TX Ethernet interface board, and uses standard TCP/IP protocol. 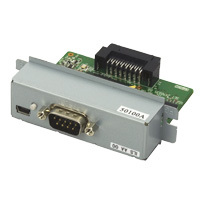 The UB-ILS is an interface board installed in the TM-series printers for serial communications. The UB-ILS is dedicated for the TM-L90 printer. The UB-ILS is a serial interface board with intelligent functions. 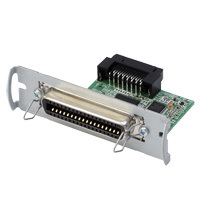 The UB-P series is a Parallel Universal interface Board with IEEE 1284 compatible. 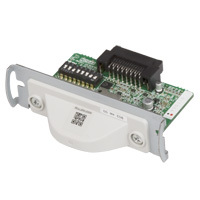 The UB-R series is a wireless ethernet interface board. 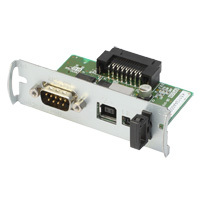 The UB-S series has the several interface module (RS-232 interface, RS-482 interface, and other module). 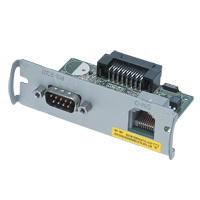 These optional boards is designed to make a variety of interfaces compatible with the TM Series printers simply by replacing the existing interface board. 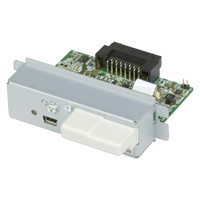 This USB module offers all the benefits of USB technology to EPSON's POS printers. Harnessing this technology, EPSON can increase port capacity to 127 peripheral devices connected from a single USB controller, increace communication speed to 12 Mbps and add the ability to hot plug the printer to the host.